The Murrow Center, working with the Woodrow Wilson Center in Washington, is leading a policy initiative on digital media in Latin America that includes top think tanks, academic centers, civil society organization, press freedom advocates and tech companies in Latin America and the United States. The initiative seeks to find Latin America’s own balance between online free speech and free press versus the demands for privacy and economic development in a fast changing digital environment. 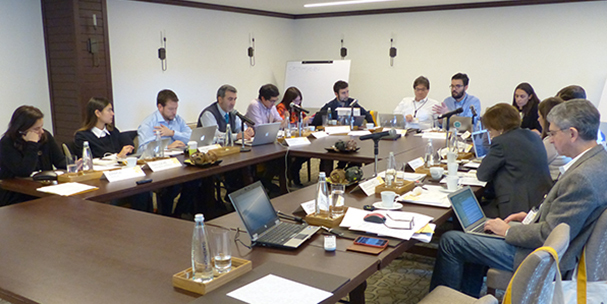 The first workshop was held in February in Bogotá, Colombia. Sponsored by the Annenberg Foundation Trust at Sunnylands, with additional support from Google, the multi stakeholder group found consensus on many issues. Among the next steps was a preliminary proposal for training of legislators and journalists in the region. The institutional participants in the initiative include the Institute for Technology and Society of Brazil, Derechos Digitales of Chile, R3D of Mexico, the University of Palermo Law School’s Center for the Study of Free Expression and Access to Information in Argentina, the University of Los Andes Law School in Colombia, the Gabriel Garcia Marquez Foundation for a New Iberoamerican Journalism in Colombia, the Special Rapporteur for Freedom of Expression of the Inter-American Commission on Human Rights, the Electronic Frontier Foundation, the Committee to Protect Journalists, the Inter American Press Association and Public Knowledge. In Bogota, editors from La Semana, The Wall Street Journal and El Tiempo joined a dinner discussion on fake news. BOGOTÁ, COLOMBIA—Governments throughout Latin America are struggling to design and adopt laws to address the rapidly evolving Internet landscape, according to the Murrow Center for a Digital World at Tufts University’s Fletcher School of International Affairs. Legislators and regulators often act too quickly to understand the full complexity of the issues at hand, while civil society actors have insufficient resources to maintain a sustained impact on the policy-making process. At a February 2017 meeting organized by The Annenberg Retreat at Sunnylands, the Woodrow Wilson Center’s Latin American Program, and the Murrow Center, more than a dozen experts from across the hemisphere convened in Bogotá, Colombia for a three-day workshop in February 2017. The goal was to launch an initiative aimed at producing consensus around model laws that foster innovation and economic development in the digital sphere while protecting human rights, free speech, and privacy. Participants and guests attending the Latin American Digital Media Policy Workshop: Online Free Speech/Free Press versus Privacy and Economic Development came from Argentina, Brazil, Chile, Colombia, Mexico, Peru, the United States, and Uruguay, representing government, the private sector, the media, international NGOs, and academia. The initiative is co-chaired by Edward Schumacher-Matos, director of the Edward R. Murrow Center for a Digital World at the Fletcher School at Tufts University, and Cynthia Arnson, director of the Latin American Program at the Wilson Center. Topics for discussion centered on the tensions and trade-offs between the right to be informed vs. the right to privacy in digital media; the “right to be forgotten” vs. the need to be able to access the historic record; and freedom of expression vs. censorship. One key issue that emerged was how these tensions influence the formulation of public policy and the challenges with regards to security, privacy, transparency, and government openness. The “right to be forgotten” is a term that exemplifies the complexity of the issues with which digital media grapple daily. Indeed, it has a different legal interpretation in different countries. Its definition has particular implications in terms of who is entitled to request the deletion (or de-indexation) of information on the Internet, before whom that request should be made, on what basis, and what procedure should be followed. There was general agreement on the difficulty of drafting legislation, formulating policy, or reaching consensus on topics that are permanently and rapidly evolving and that involve many stakeholders with different and, at times, competing interests. Although Latin American countries have generally followed European legislation in terms of freedom of expression, the region has become increasingly autonomous on the right to be forgotten, to the point that it can even “export” knowledge on these issues. The implications of legislating on the right to be forgotten are numerous and far reaching. For example, it is possible for individuals to pay private companies to clear their records before embarking on a political career, even if access to past information could be considered in the public interest. Moreover, the obligations of intermediaries (e.g. search engines, social networks) are not entirely clear. Participants in the workshop agreed that there is no clear-cut solution to the problems that arise around the tension between the right to privacy/right to be forgotten vs. freedom of expression/absence of censorship: whenever there are guarantees to prevent censorship, there is a likelihood that someone will be harmed by being publicly exposed and vice-versa. Privacy issues also arise with respect to big data, and especially the access by both online companies and governments to large amounts of personal information. Protecting privacy in the age of big data is ever more complex and challenging. For example, the access to so much valuable free information and services online, especially for Latin America’s poor and young, derives in large part from the ability of platform, search engine, and other online companies to turn personal data into income from targeted advertising. Most, but not all participants, favored tilting more towards freedom of expression/information than towards the right to privacy, in part because of a fear of censorship. It is a fear that grows out of the region’s history with dictatorship and authoritarian governments; that history in turn has led to the creation of strong hemispheric conventions that favor freedom of expression and human rights, which have come to include access to and freedom of information. The challenge, all agreed, was finding the right balance of corporate ethical standards, judicial interpretations of existing law, and, if necessary, government regulation to minimize abuses of privacy. The group discussed many specific such measures. Another related digital issue that has exploded in the public consciousness concerns “fake news.” The group agreed in a dinner discussion with some of Colombia’s leading journalists that the issue was broader than stories invented out of whole cloth, and includes all politically motivated misinformation spread knowingly and unknowingly via social media. Misinformation and invented stories have always existed, but the speed and breadth with which they can spread today on the Internet has created a whole new level of threat and potential instability in Latin America. Anonymous trolling adds waves of anger. Institutions in the countries of the region are not as strong as in the United States or Europe, and have difficulty resisting a growing public cynicism and lack of trust online about government, the news media, and other institutions that hold a society together. The group agreed that efforts to limit these damaging effects while preserving free speech in the particular environment of Latin America’s democracies deserves much greater and deeper consideration than the phenomenon has received to date. Participants in the workshop also grappled with copyright laws and the liability of publishers and distributors for potentially or effectively damaging content. Some nations, such as Ecuador, are using copyright law as a backdoor form of censorship to put pressure on independent private news media. Given the numerous outstanding challenges and the uneven development of legislation in the region, participants pointed to the need for greater training of legislators, legislative staff and other policymakers on these issues. In a final session on next steps, participants agreed on the need to help train legislators, regulators, and journalists grappling with these fast-changing issues. The training was seen as a vital complement to a new effort by the Organization of American States to train judges. If the world’s advanced industrial nations are struggling to keep up with challenges presented by the pace of technological change, imagine being one step removed in a Congress, ministry, or newsroom in Latin America, feeling the unceasing new repercussions caused by digital change but having little participation in its development. For a complete list of workshop participants and guests, please click here.